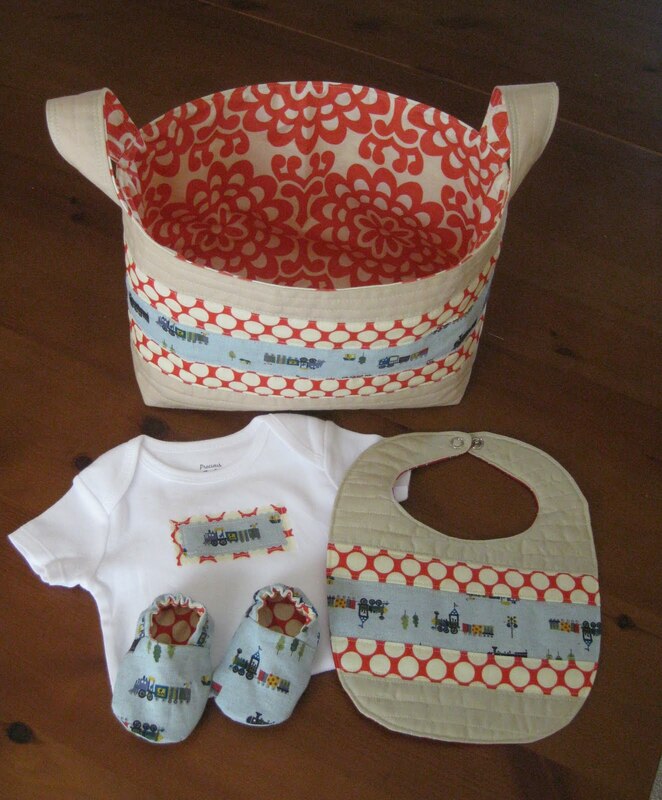 I had fun making up my own pattern for the basket. 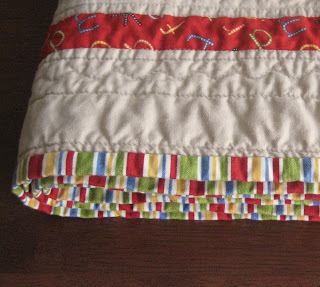 It uses the same basic construction as a basket I've made before, but this one is quilted, so it's studier. 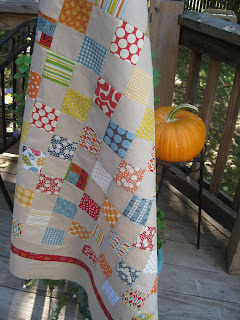 I also used strips of fabric pieced together, instead of squares, and I made it larger. 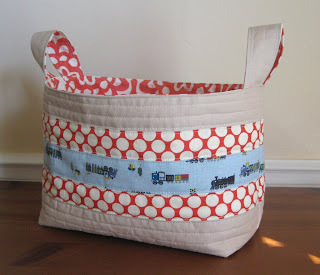 This one will be perfect for holding baby toys, diapers, or whatever the new mom needs it for. 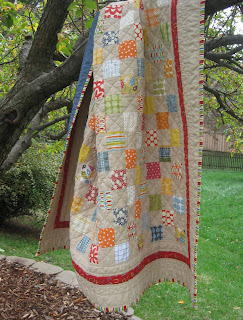 I know you're thinking I already posted about this quilt, right? 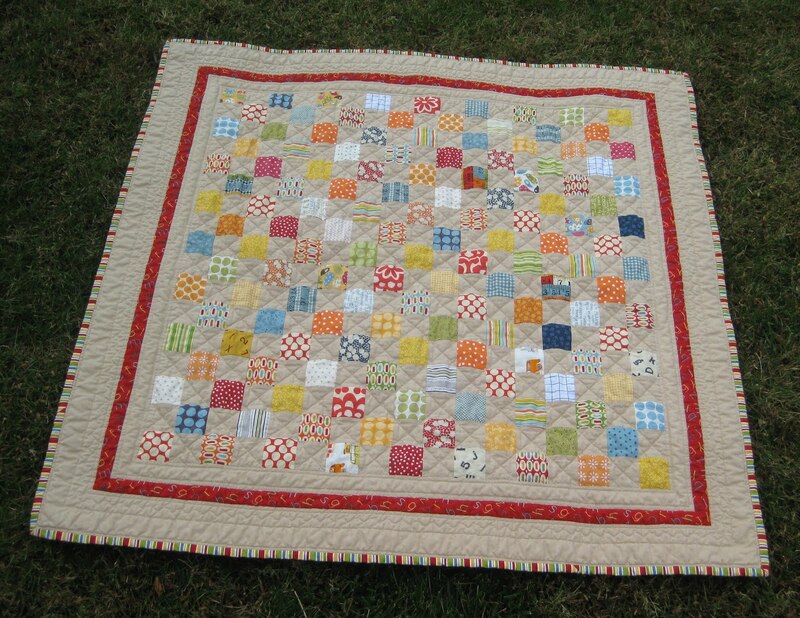 Actually this is a second, slightly smaller version of the Scrappy Squares Baby Quilt. You can see I varied slightly from the first quilt by using different fabrics for the border, binding and back. 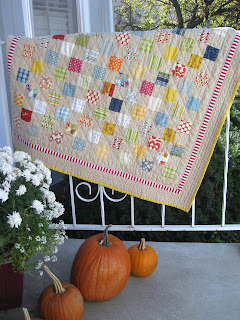 I got to see my original vision of a red striped border come to life. Pretty fun! 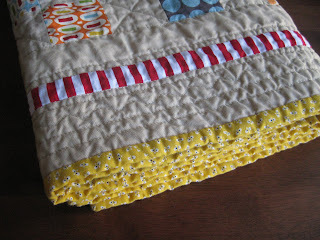 Love a stripe, when used in a skinny border like this. 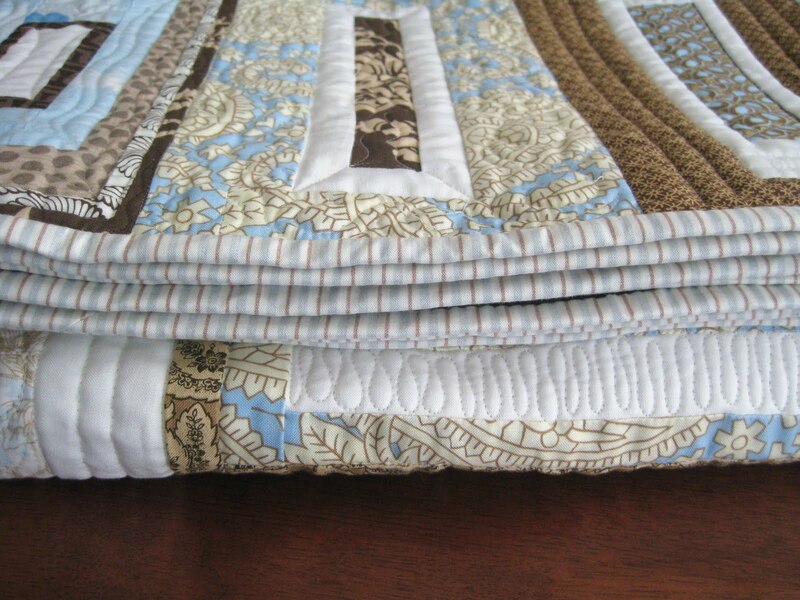 Even after making a second quilt, I still had some squares remaining, so I made this matching quilted pillow. 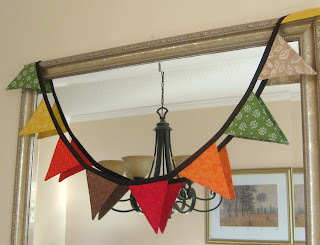 I also could not resist making a small string of bunting. Update: The bunting is still available in my shop. Ahh, it's done. What a good feeling. 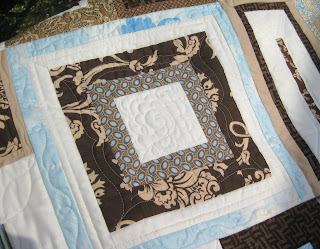 You can see I went in another direction with the quilting after the tension distaster. I'm happy I did. 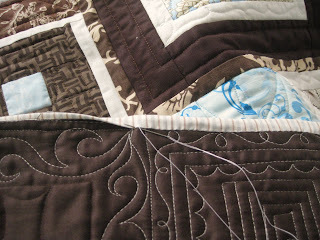 I like the look of the combine straight stitching with the decorative stitch. Im not giving up on free motion though. Thanks for all your suggestions! 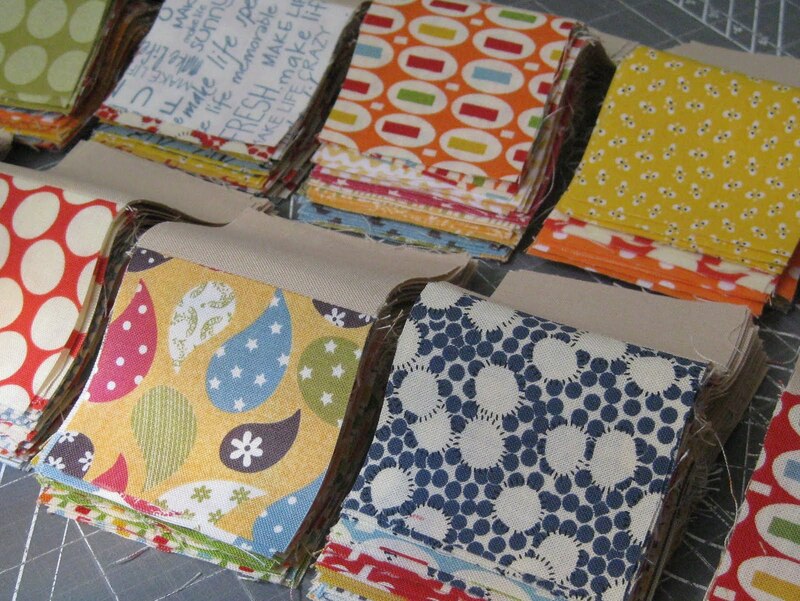 I 'll be doing some experiments on test squares this week. Or rather, check the tension. 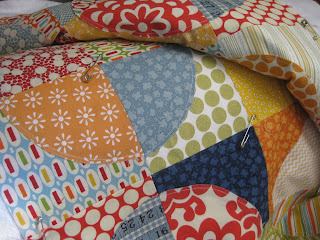 I'm spending naptime with my seam ripper instead of binding this quilt today. Boo. 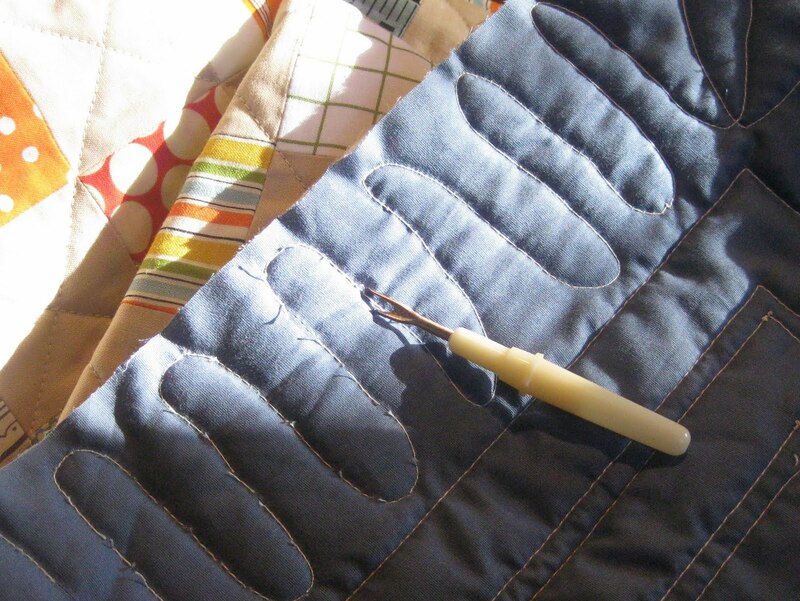 I happily squiggled my way, free motion, around the final border of the quilt without checking the tension on the underside. 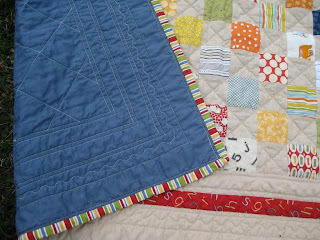 I had no problems on the rest of the quilt, just with the free motion. Anyone know how to fix this? Play around with the tension adjuster? Figure out how to adjust the tension on the bobbin? I need to dig out my manual I guess. It's nice to know I'm not alone in the occasional dumb mistake. Thanks for sharing this funny story Jacquie. 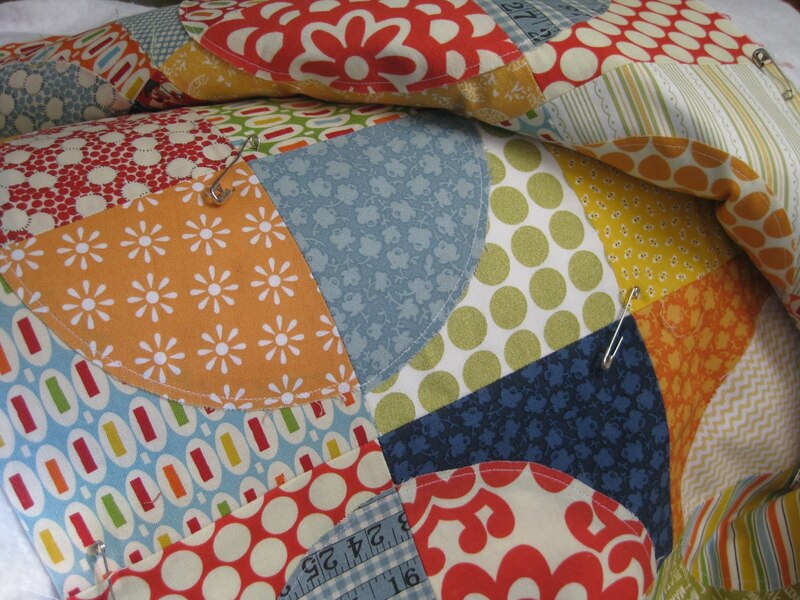 Even the president of the best Modern Quilt Guild in the country (just a bit biased here) can make mistakes. Thank goodness for that. 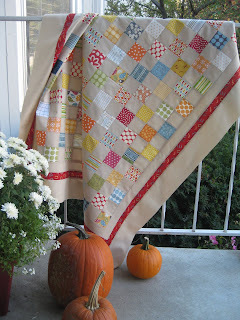 I joined my first virtual quilting bee a year ago on flickr. Briefly, a virtual bee consists of about 12 participants. 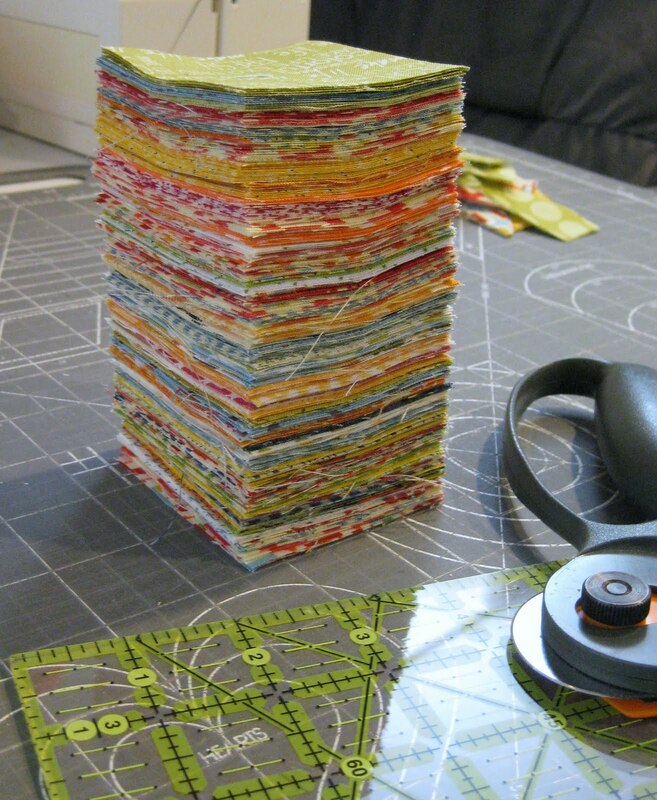 Each month one participant sends fabric and instructions to everyone else, and the others send back a block or more to that person. 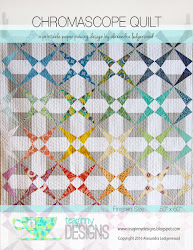 My month was back in February, and I received some really fun blocks (the original idea for this quilt was borrowed from Isa - thanks!). Thanks to the ladies in my first bee! 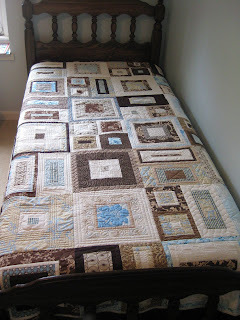 I made about half of the blocks that came together in this quilt. I'm so happy to see the finished product. It measures 60 x 84. 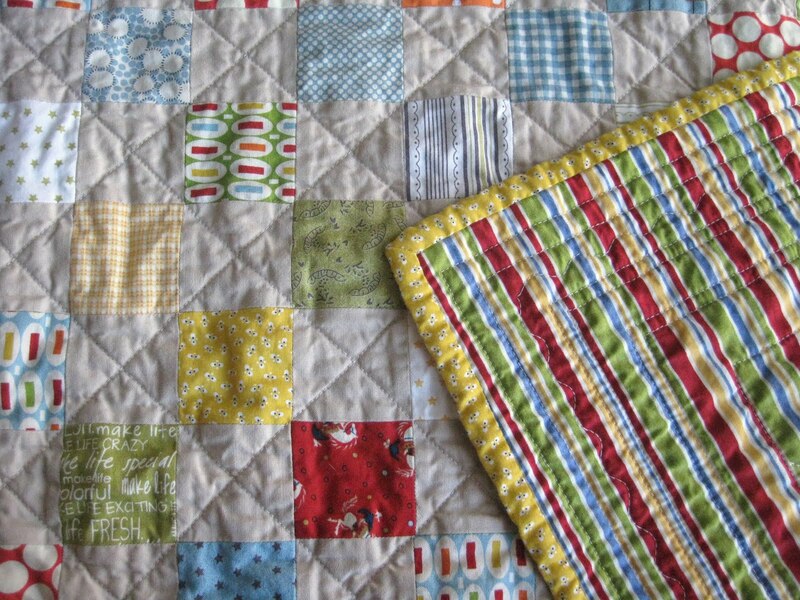 The quilting really makes this quilt special. You can see how amazing it is! How cool is that!? 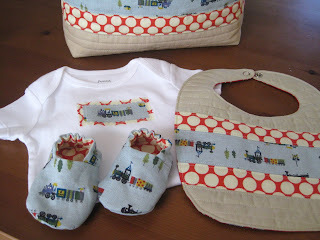 The artist who created these unique designs is Angela. 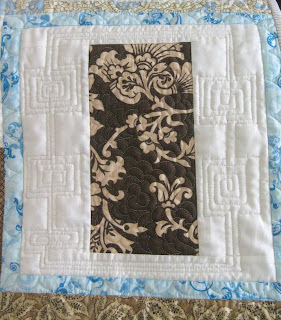 I love that each block is quilted differently. 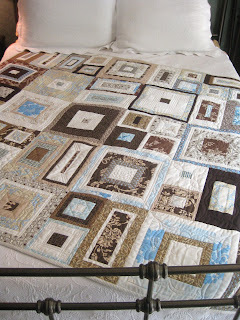 That makes the quilt so interesting to look at. Thank you Angela! 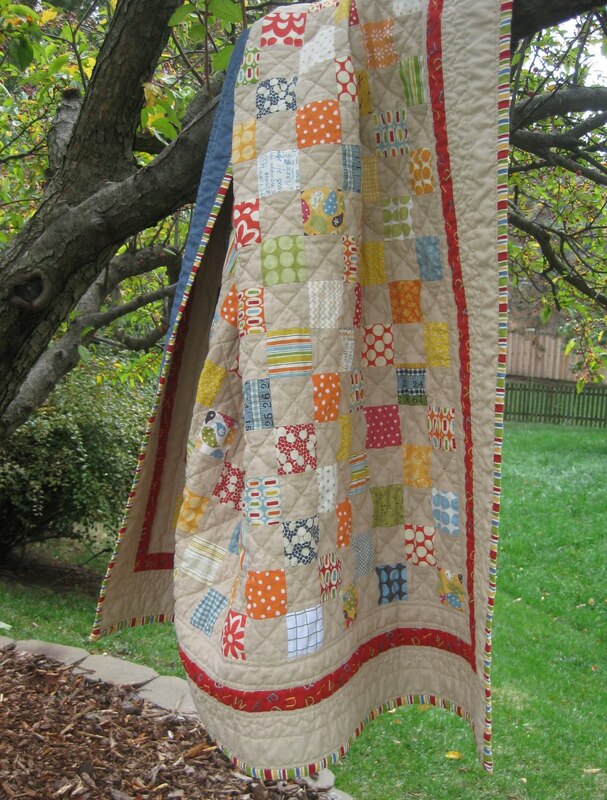 I will enjoy this quilt for years to come, and the collaborative aspects of it made the whole experience so fun. Lots of things in process here. 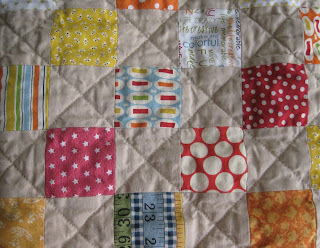 And no, this quilting is not done by me (isn't it fabulous!?). More on that with the full reveal soon. 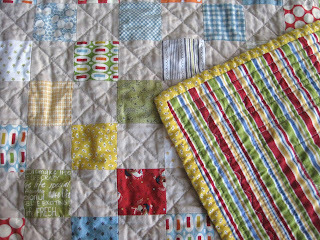 While it's certainly not as perfect as a Rita quilt, I am really loving this scrappy squares quilt top. 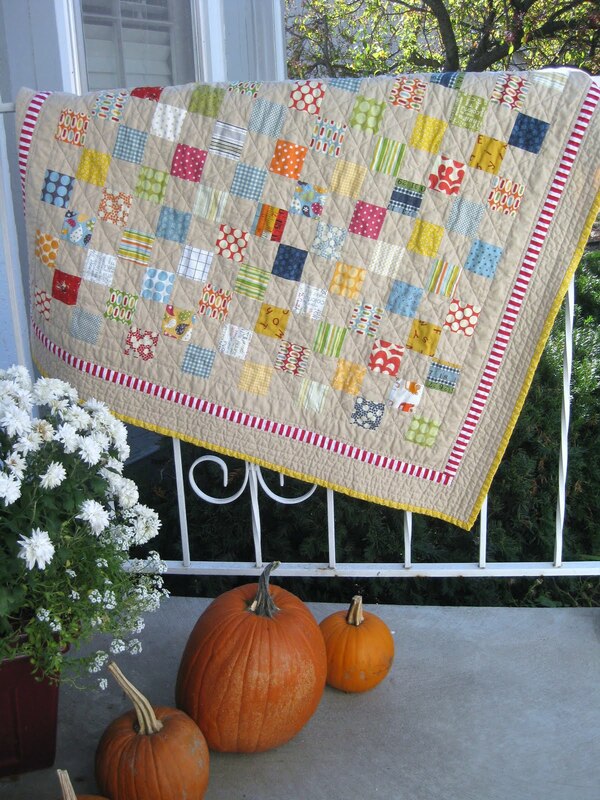 I originally invisioned a red and white stripe for the narrow border, but I went with something I had on hand instead. 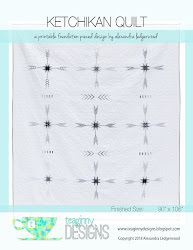 I think it is a little overpowering, so for the twin of this quilt, I'll order a stripe. Yes, I have enough squares pieced for another one of these :). It's fun to try a single design in a couple of slight variations. That will be coming soon. I've resisted the urge to break into this stack for a while now. 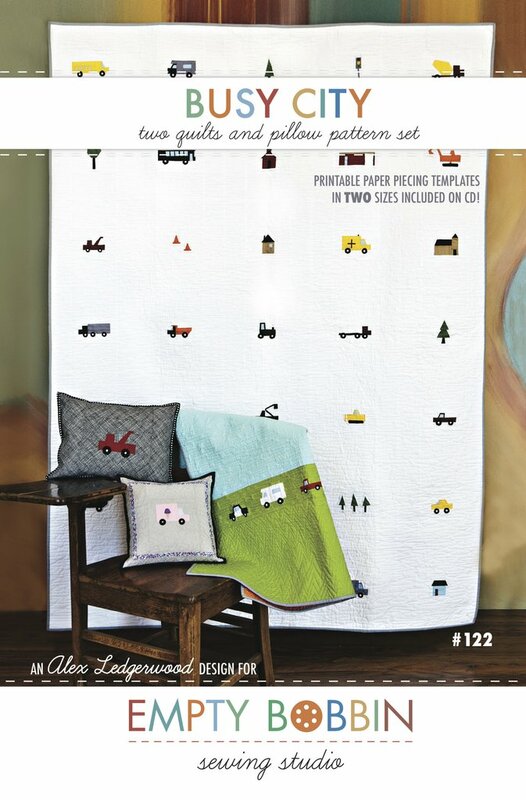 I'd just finger the squares every now and again and ponder quilt patterns they could be used in. 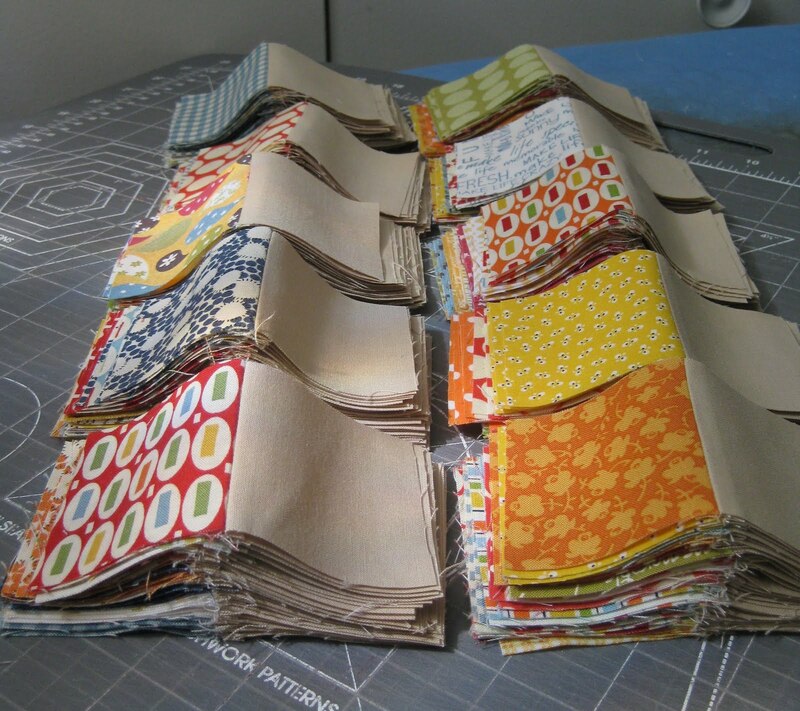 I wrote about how they were salvaged from another project, earlier. 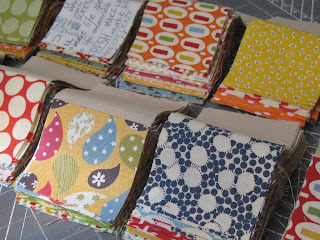 Well I could resist them no longer, and they are being paired with Kona Khaki. 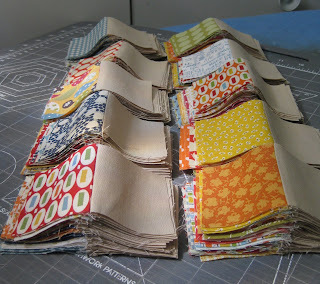 I've never done a square only quilt - I'm pretending to be Rita or Ashley while I'm piecing :). Hopefully the results will be as cute as many of theirs. It must really feel like fall - even my sewing projects are autumnal. 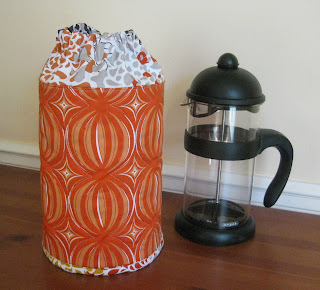 The coffee press cozy born of the fabrics in my last post. 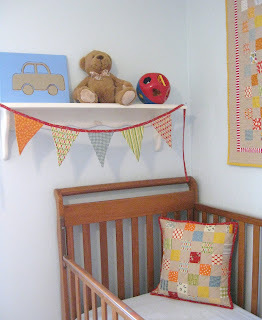 And some bunting for fall decorating. I'm not much of a seasonal decorator, but I admire those who dress their homes accordingly. This string is for a special lady who really does it up right.